Science-fiction films do not come cheap. Star Trek Into Darkness reportedly had a budget of $190 million, while the Will and Jaden Smith vehicle After Earth, which opens this weekend, cost $130 million. (Side note: Jaden Smith recently shared with New York Magazine that his dad watches “hours and hours of TED Talks.”) That’s why it’s so thoroughly amazing that Mars et Avril, a stunning sci-fi epic set in Montreal 50 years in the future, was made with a budget of just $2.3 million. 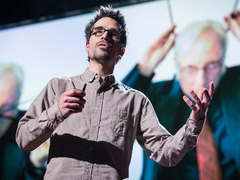 Martin Villeneuve: How I made an impossible film “I made a film that was impossible to make, only I didn’t know it was impossible,” says scriptwriter, director and producer Martin Villeneuve in today’s TED Talk, given at TED2013. In the talk, naturally, Villeneuve reveals how he did this: with very creative problem-solving. For example, when Canadian superstar Robert Lepage said he would only have a few days available for filming, Villeneuve opted to turn Lepage’s character into a hologram, so that another actor could play him by wearing a greenscreen mask. To hear more about the making of Mars et Avril, watch Villeneuve’s talk. Here, some incredible images from the movie, along with notes from key creators on set about how they happened. All these images from Mars et Avril are courtesy of Martin Villeneuve, Mars et Avril Inc. © 2012. Watch the film’s trailer, opening sequence, or a short video on how the visual effects were created. Or order this great film on DVD. Seeing a movie like this on this budget is just amazing. Listen to his lecture on TED Talks as he talks about turning problems into solutions.